Another rack was on the range being test fired, and about twice as many were already in boxes at the shipping room. This entry was posted in shotgun and tagged 12ga, keltec, KSG, pump, shotgun. Bookmark the permalink. 23 Responses to They do exist! Just can’t get past the fact that Kel Tec puts out cheap plastic junk. I have the Sub-2000 in my safe to prove it. Have fun, though. thats great, maybe by time i get back from deployment they will be in stores. So They’ll join Santa and the M&Ms fainting dead away as they behold each other! I need a weapon! A lot of weapons! Come on Oleg that picture is just a teaser. 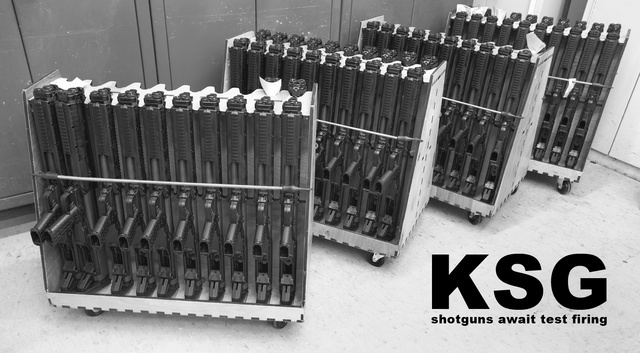 And that number of KSG shotguns is hardly going to put a dent in the demand. Now if you saw several thousand in boxes ready to ship that would be different. I am in need of a new shotgun; however, I haven’t seen one of these in the wild, but rest assured I’ll be snapping one up as soon as I do! But does the RMR-30 really exist? Based on my periodic checks at gunbroker and my favorite on-line gun shop, the answer is a resounding “no”. So about 300 are known to exist, by your evidence. Production rate would be useful to know next, because if it is 300 per year, the demand will remain unsatisfied. Just the other day, Elvis and I were at the range when the Easter Bunny got on line to blast a few holes in paper. He had a RMR-30 and let us check it out. Sweet gun. He said he had borrowed it from Santa. Seriously, Kel-tec needs to ramp up production. Were you sitting on a unicorn while shooting these pics? I would assume the unicorns are about as common as the KSG in the real world. My guess is Kel-Tec has low production because Eng.Kellgren doesn’t want any shareholders. Once your company is not wholly your own, and someone whom you don’t trust is in, it can get a lot worse. I got mine! Range trip tomorrow! Pingback: Kel-tec KSG news anyone?? It sounds like Kel-Tec has taken our criticism and gripes as they were intended, constructively! Can’t wait to see these in stores and snap one up. So … ~ 62 KSGs in racks, with 124 KSGs in boxes. Oh….so THAT’s how they reproduce! Wonder what the gestation period is…months or years? Breeding program needs to get some little blue pills on order, stat! They kind of look like the Star Wars stormtrooper blasters.